Day 28 ~ What a day! – Everything Your Mama Made & More! So today was the last day of the stash game I was playing this month. I decided I wanted to go out with a bang & I think I can safely say I did! 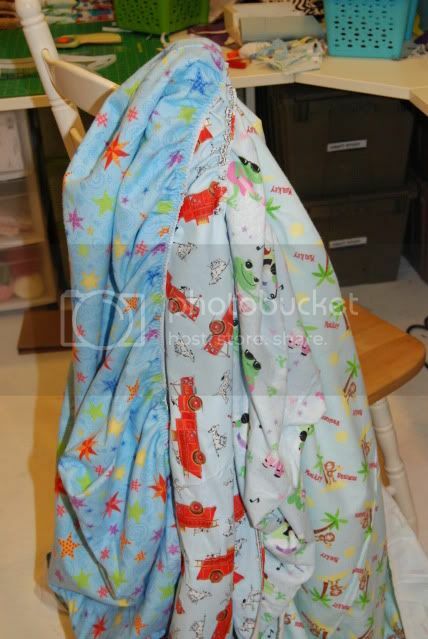 I sewed up 31 yards of fabric today alone! I am happy to say I accomplished all my stash game goals for the 1st time ever. I am seriously blown away with what I got done today!!!!!!! 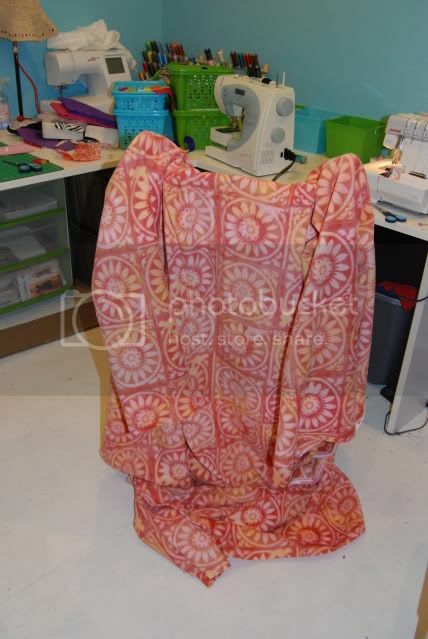 First up the Snuggies… I made one for my mother in law for mothers day & then I made toddler size ones for the kids which they LOVE! I managed to make theirs out of just 1 yard of fleece each! I will try to get action shots later. 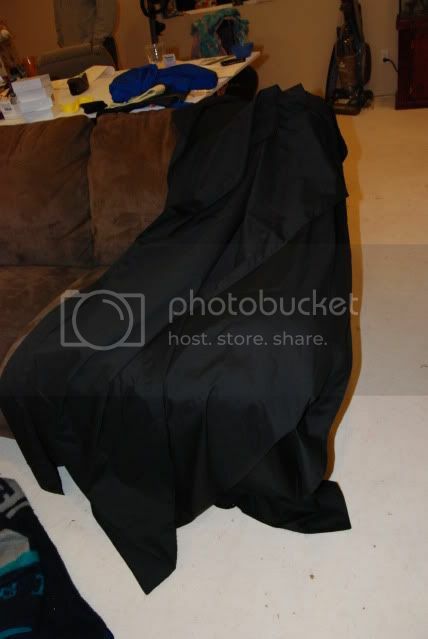 Next are some black curtains… hard to tell what they heck they are in the pic… B is installing the rod right now so I will get better ones later. These are for Zanders pirate room, they are long to look like a hanging flag when closed. At some point I will applique a skull & bones on them to look like a pirate flag, but for now he just needs curtains! I used double layer fabric to keep the room dark. 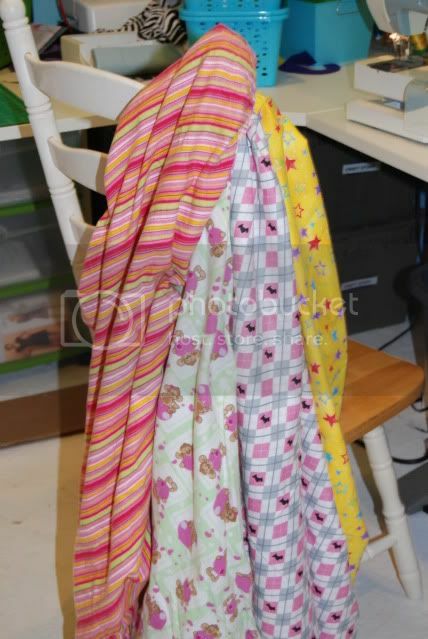 Then there was all the scraps… my scrap bin was starting to over flow! Between gifts & starting to make stock for the local market I decided to whip up a bunch of booboo buddies! They are basically small kid size corn sacks that you can heat up or freeze for booboo’s. The mini’s work great for my twins when it’s more a scare & comfort thing, the bigger ones are great for minor bumps & booboo’s that actually need more then a minute or two of heat or cold. They are also AWESOME for warming up & having little ones with ear issues lay on… they make it feel better & they heat helps the wax drain! The mini ones actually make great bean bags too, go figure! 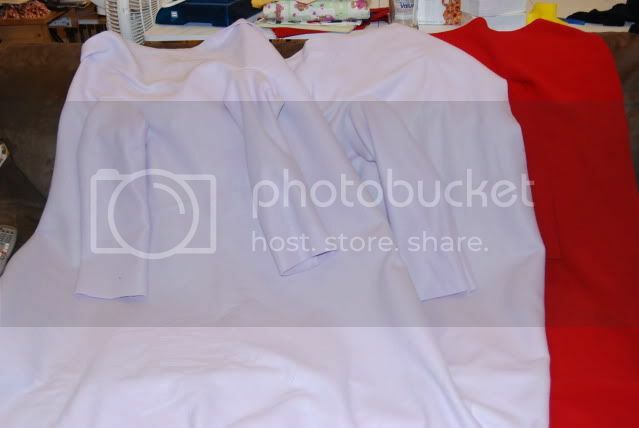 Anyways there are 2 sizes & some used a different scrap for each side. 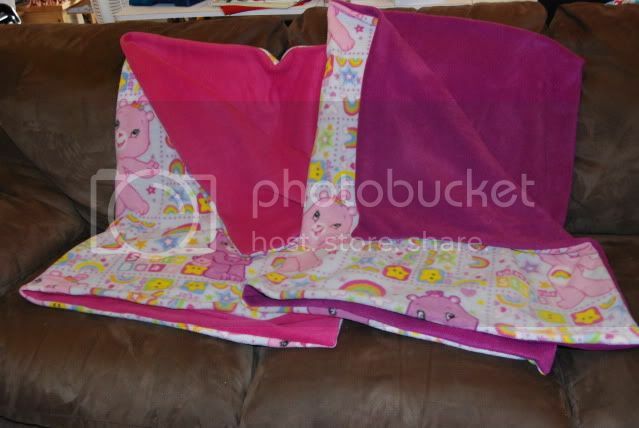 Then there are some the fleece Care Bear blankets for the twins. They didn’t let me top stitch them, but they at least let me sew the turning hole closed! They love any & all blankets. The pink backed one is Carlie’s & the purple backed one is Baylie’s. Finally some more sheets! Most are for an upcoming etsy team event for SewingMamas on Etsy . 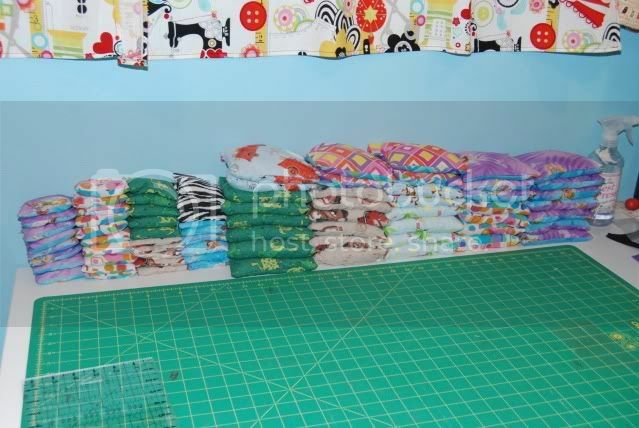 There are 4 crib sheets & 4 pack ‘n play sheets all made with super soft flannel! 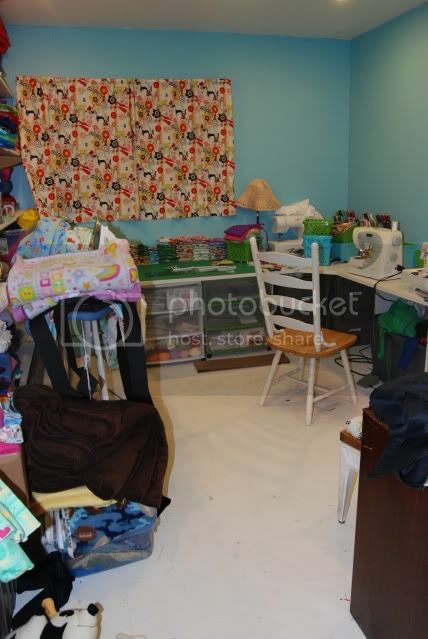 I think the biggest treat of all may be that my sewing room is still pretty darn clean!!! 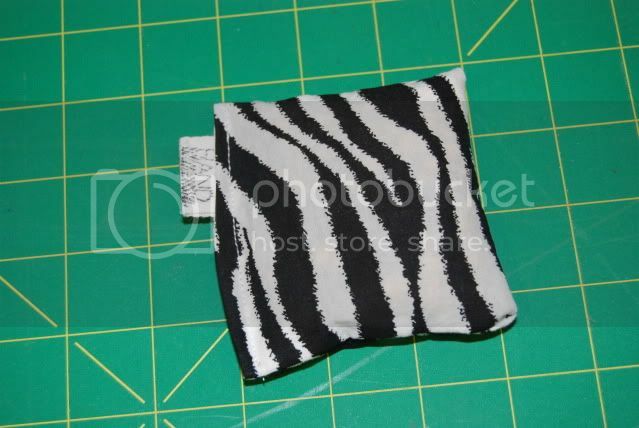 I have sewn up 100 yards of fabric during the month of Feb which was 25 MORE then my goal!!! That doesn’t include the hundreds of scraps too! Plus I made all the items I had on my to-do list! And I didn’t buy any fabric to boot!!! Those booboo buddies are adorable. What kind of corn do you use? feed corn.. it isn’t sealed so it doesn’t pop. That is so amazing! You did so well! Congratulations! Well done Kymy, what a great effort. I really need to do a stash game or 10 to get a handle on my stash lol. Hopefully my handmade christmas will help put a dent in it. Where do you get feed corn? Sorry if that’s a dumb question. I love the booboo buddies idea, and have wanted to make one for a while I just never knew what to fill it with. The local feed/farmers supply store.